First thing first, I want to wish a very happy birthday to the woman who brought me into this world. Happy Birthday, Mom! 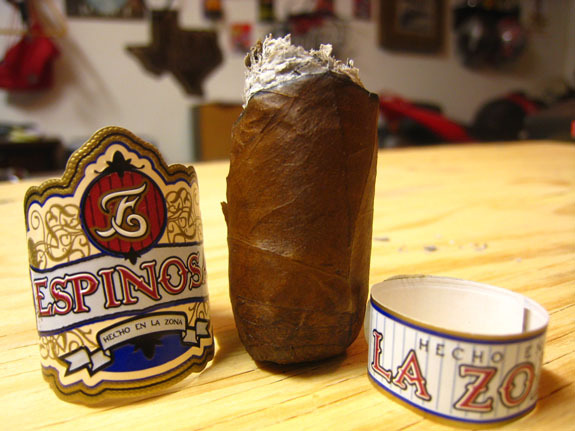 Last week, Daniel reviewed the La Zona Habano by Espinosa Cigars. 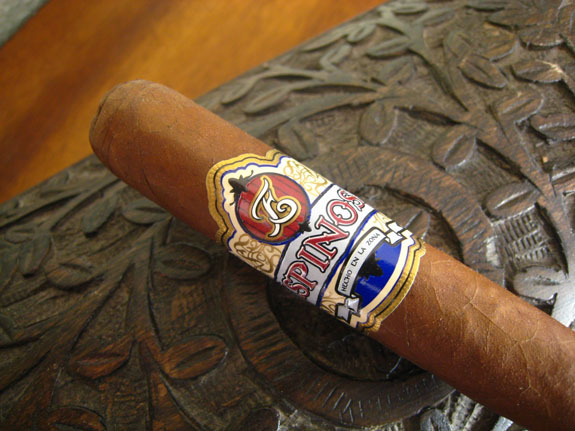 Today, I bring to you another offering from Espinosa Cigars, the Espinosa Habano. The Espinosa Habano is Erik Espinosa’s first cigar to come out of his La Zona factory in Esteli, Nicaragua and is available in four vitolas: Robusto (5 by 50), Toro (6 by 52), Belicoso (5 1/2 by 52) and Trabuco (6 by 60). 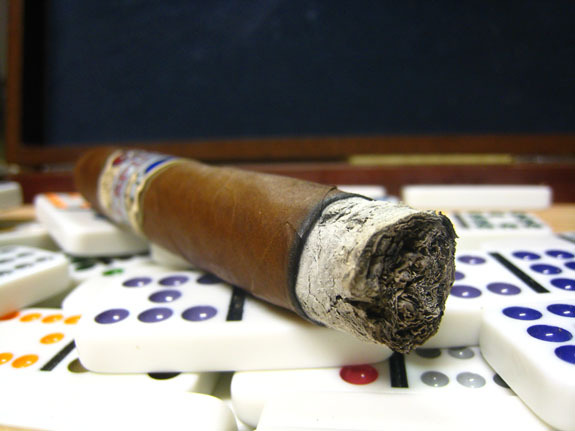 The Espinosa Habano sports a primary band and a secondary foot band. The color choice and design on the primary band makes it very unique and, while not my favorite band, very eye catching. 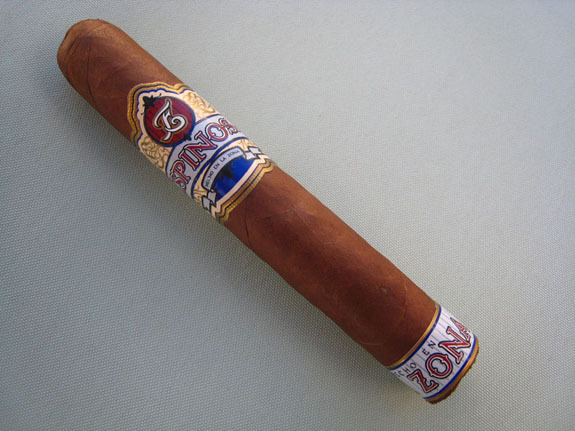 The foot band has the name of the factory where the Espinosa Habano is produced, La Zona. The medium brown wrapper is consistent in color and, other than a couple of medium size veins, the wrapper is very smooth and packed firmly from head to foot. The aroma off the Habano wrapper is of tobacco, mild pepper, and a faint cedar. The foot comes across much richer but of the same aromas. The triple cap clips easily leaving a small crack running a half inch up. The draw is perfect. After fighting the draw on last week’s Cardinal Maduro, I am looking forward to this. A spice is left on my lips, and the cold draw brings out tobacco and a clove-like flavor. The foot band slides off with ease. The first thing I notice is the mouth feel of the smoke. I was completely blindsided by this. The smoke is full and creamy, and coats the entire mouth with each puff. The profile has a rich, cedar core with pepper and a spice tingle at the back of the throat. The finish is somewhat dry of toasted cedar. The thick eyeliner burn is producing an ash, which is white on the outer edge, but the filler ash is much darker. A copious amount of smoke fills my mouth on the draw and blue smoke is pumping out while resting. A quick touch-up was required to get a small portion of the wrapper to burn. 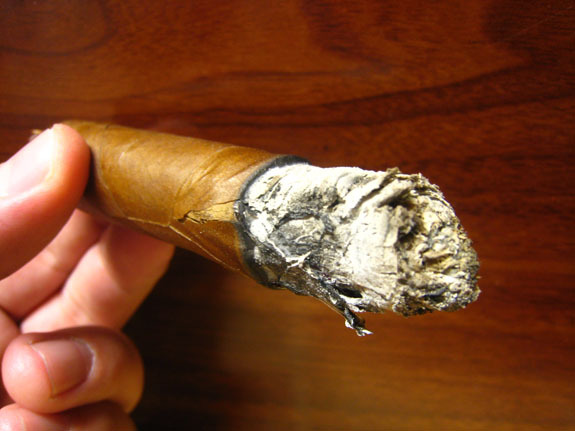 The flaky ash held strong for over an inch before tumbling into the ashtray. Flavors are medium/full and the strength is a steady medium. A crack has formed down the wrapper leaf which runs approximately an inch and a half. The flavors have not evolved much from the first third. Unlike the pencil shaving, cedar flavor I have become accustomed to in other cigars, this is a rich, sweet cedar that is extremely enjoyable. The spice in the mouth has become faint, but as I push it through my nasal passage I am hit with a pepper and hot, spice blast. The finish now has an added element of cocoa. I am still experiencing minor burn issues, which seem to be a result of the cracked wrapper that has pulled away from the rest of the cigar. I just can’t get over the mouth feel of the smoke. 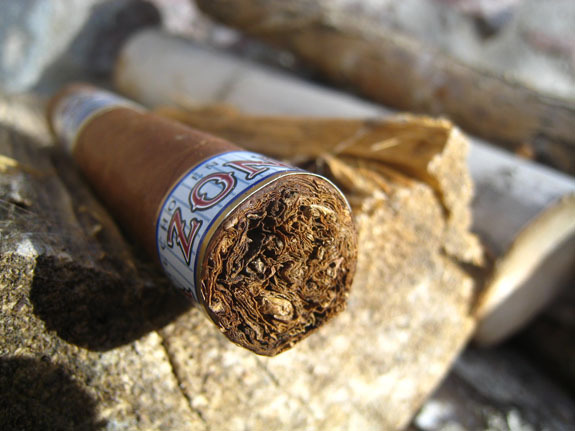 The chewy, creamy smoke compliments the sweet cedar profile. There are some notes hiding in the background that I can’t put my finger on but they are in the area of a caramel or cocoa flavor. The finish has become toasty, with some black coffee and a hint of bitterness. The retrohale is intense and wonderful, showcasing the Nicaraguan pepper that I love . With another touch-up, I have finally surpassed the crack in the wrapper on the Espinosa Habano. The burn has become razor sharp, which confirms that the crack was causing the previous burn issues. Another crack has formed at the cap. Flavors remain medium/full and the strength is borderline full. 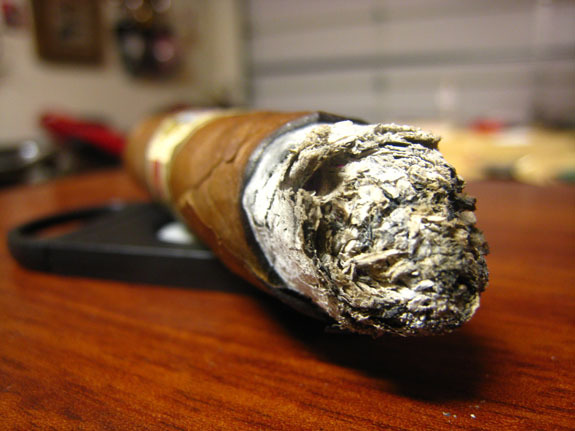 I was not aware of how delicate the Habano wrapper was on the Espinosa Habano, and to say the least, I did not take the best care of the cigar this past weekend. Due to having my travel case under filled, I believe the cigars may have been bouncing around a little too much. All in all, the wrapper crack and related burn issues were not a major annoyance. When a cigar is delivering in the areas of flavor, body, and strength, I am more than willing to touch up a cigar a couple of times. The cigar was not overly complex but it hit the spot for me. 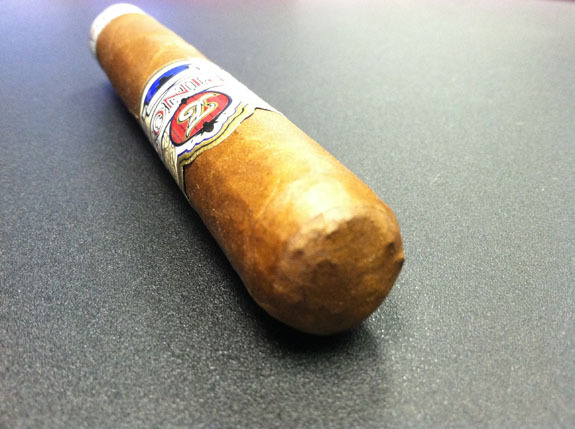 Espinosa Habano cigars can be picked up at Smoke Inn for a price of $6 to $7, which makes this an easy buy in my book. These sticks must be flying off the shelves because the only vitola remaining in stock is the Trabuco (6 by 60). So grab them while you can and let us know what you think of the cigar.